SOLUKHUMBU, Dec 11: Khumbu Pasang Lhamu Rural Municipality has earned Rs 49.7 million from tourism fee in this tourist season. On a monthly breakdown, Rs 8 million was collected in September, Rs 26.6 million in October, and Rs 15.1 million in November. The rural municipality had started collecting Rs 2,000 per person from foreign tourists since October 2017. In 2017, a total of Rs 38.3 million was collected as tourist fee in two months of the tourist season, when 19,175 tourists visited the Khumbu region in October and November. According to the official records, 24,896 tourists have entered the rural municipality in this season. A total 4,360 visited the region in September, while 13,308 visited in October and 7,552 in November. The officials are seeking to make use of this fund to promote tourism promotion in the region. The amount collected is set to be used to improve and construct roads between Lukla and the Everest Base Camp along with increasing tourist infrastructure in the region. According to Lakpa Chhiri Sherpa, spokesperson of the rural municipality, some part of the collected money of the previous year was spent for tour guide and porters. Despite local entrepreneurs' strong opposition to the collection of entry fee, the officials have been collecting the fee. 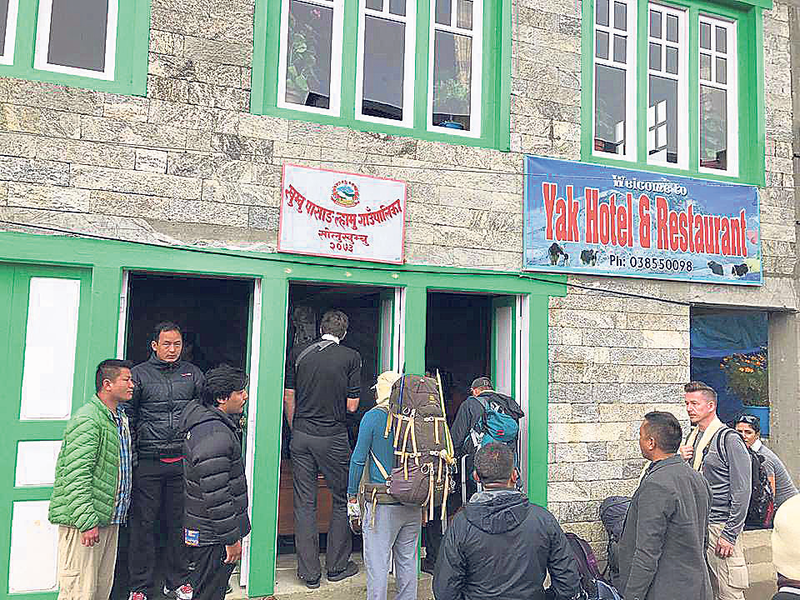 They do not even recognized the Trekkers' Information Management System (TIMS) card issued by the Department of Tourism (DoT) and the Trekking Agencies Association of Nepal (TAAN).